Tailored offers are available to support successful candidates including free accommodation. We currently have exciting opportunities for enthusiastic and dynamic Specialty Doctors to join our Emergency Department. Full and part-time applications will be happily welcomed and the posts are available as soon as the ideal candidates are found. Candidates for these roles must have full GMC registration with a licence to practice with previous NHS experience being desirable. 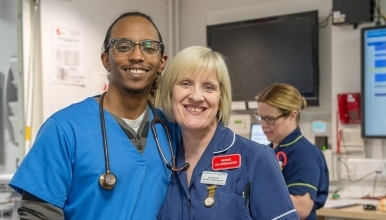 This is an exciting time to join our Emergency Department’s team which are the heart of the Trust's services. Our highly motivated Emergency Department provides services for over 500,000 patients over the county of Shropshire and Mid Wales. You will be working alongside a friendly, expert and energetic team of Consultants, SAS Doctors, higher specialist trainees, Junior Doctors (10 at each hospital, ENPS and Nursing staff. The whole Department is overseen by the Emergency Department Consultants. We have also recently started working collaboratively with the Virginia Mason Institute in Seattle. We are one of only 5 UK hospitals to receive this support, from what is regarded as the safest hospital in the world. This collaboration means employees can benefit from the KPO (Kaizen Promotion Office) and Value Stream work, gaining valuable help and guidance regardless of your level of expertise, it poses a unique opportunity to make a difference and encourage safe working. Shropshire is a beautiful county located between the West Midlands and North Wales. Whilst rural and home to the Shropshire Hills it is anything but sleepy with plenty of activities to choose from to suit a variety of interests and hobbies. If you would like to find out more about the Emergency departments and our Hospitals, then we would invite you to contact Mr Subramanian Kumaran or Dr Adrian Marsh with any questions you may have on 01743 261082. Find more information on the Shrewsbury and Telford Hospital NHS trust and its surrounding areas please follow the links on this advert. We look forward to receiving your application and hope to welcome you to the trust very soon.